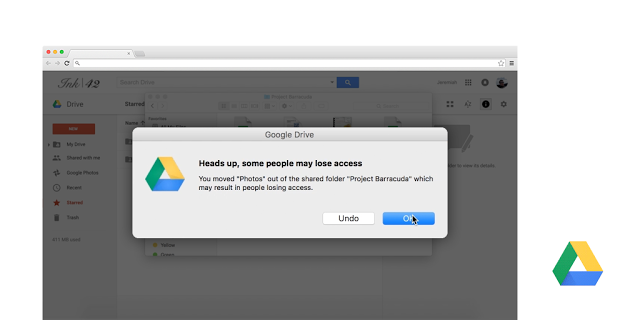 Google Drive for Mac/PC just got better! Now sync only the subfolders you need. Google Drive for Mac/PC — the app that syncs your computer with Google Drive — is an easy way to make sure your files are safe and accessible from anywhere. Today, we are releasing new features that make your syncing and sharing experience better and faster, too. While syncing top-level folders is already possible, you can now choose which subfolders from My Drive to sync to your desktop. To do this, click Preferences > Sync Options > Only these folders… Here, you’ll be presented with a list of subfolders from Google Drive that you can check or uncheck to enable or disable syncing. While you get tons of storage with Google Drive, your local desktop may not have the same amount of free disk space. Now, Drive’s interface will show the size of your individual subfolders as well as the space remaining on your computer. It will also warn you if there is not enough space to sync.On top of that, during setup, if the default folders don’t fit, Drive will guide you to use selective sync to help you better manage your storage space from the start. When you’re working with folders on your computer, moving and deleting things is simple. But, doing that with shared files or folders can cause others to lose access. Now, Drive warns you so you’ll know if someone might lose access. Please note that Google Apps administrators must first choose whether their users are allowed to use the Google Drive sync client from the Admin console, before it can be used. For steps on how to enable or disable this feature, visit this Help Center article. If you manage MSI files to install programs on behalf of your Windows users, visit this Help Center article to obtain the latest Drive for PC .msi file. The improved Google Drive sync client is available now on both Windows and Mac here. https://www.comprompt.co.in/wp-content/uploads/2017/04/comprompt-logo.png 0 0 Web Technology Comprompt https://www.comprompt.co.in/wp-content/uploads/2017/04/comprompt-logo.png Web Technology Comprompt2016-04-20 11:18:362017-01-20 10:50:08Google Drive for Mac/PC just got better! Now sync only the subfolders you need.